We hope you're enjoying the stories we post on our home page every couple of weeks. If you missed one, or want to read it again or share, you'll find them right here in our library. 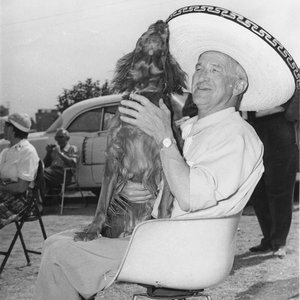 It was 1951, and the Airstream Wally Byam Caravan was traveling to Mexico and Central America. The Glassey brothers, friends of Wally assisting him on the Caravan, were driving along the highway in Mexico. They saw a hungry, frightened, lost puppy. They stopped and picked the puppy up. The young dog was a beautiful Irish Setter. Wally rescued the dog, whom he named Chica, and with food and love, Chica and Wally had that friendship that is so endearing and everlasting between man and dog. I remember as a youngster visiting Wally and his first wife Marion at their home on St. Andrews in Los Angeles. They had two dogs: Robin, a black cocker spaniel, and Skipper, a golden springer spaniel. Wally and I would take them for walks along West 1st Street. We bond with animals just as we bond with people. Take a closer look at the wonderful relationship that Wally and Chica had. What a friendship! After Wally’s passing in 1962 and the death of Chica, Stella took Chica’s ashes to Acapulco, Mexico. Wally and Stella frequented a special off-the-beaten track location. Stella returned and left Chica’s ashes in this nostalgic place, so full of memories, that Stella shared with Wally.